As Pine Box Entertainment prepares for each of Doomtown: Reloaded’s Organised Play Series, we consider feedback from a variety of sources. Notes and observations about player experiences and analysis of tourney decks help PBE understand how cards can affect player experience in a tournament setting. You may recall that for PAX Unplugged, we debuted an experience in which players helped tell the upcoming fiction. Our focus is to make attending PBE hosted events we host to be fun and entertaining experiences. Sometimes we need to look at altering or banning cards. Bans do not necessarily arise from cards having high power levels, but also cards creating a negative experience that may result in players not wishing to attend organized events. In looking towards to the Tombstone Series, Worlds, and Convention Events planned in 2018, PBE identified two cards to take action on: Showboating and Nicodemus Whateley. Showboating: Ban effective immediately: Showboating will no longer be a legal card for organised play events. We hope you understand Pine Box Entertainment’s decisions as detailed below. Feel free, however, to still use these cards as you normally would in casual play. 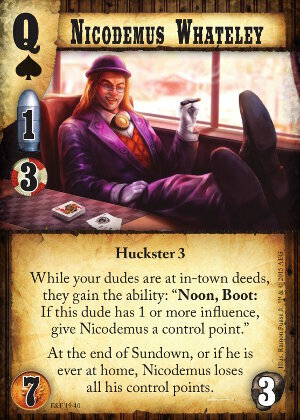 Remember for the errata, it remains that Nicodemus may still gain Control Points (to put him above 3) through other means, such as Hunter Protections or Desolation Row. Also, regardless of where the points come from, they still all go away at the end of Sundown or if he ever returns home. 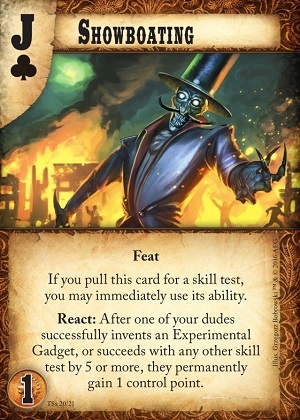 First, the card violates the fundamental contract of DTR of player interaction being the game’s primary driver. A card like Showboating allows you to win the game simply by casting spells to no actual effect. While the card opened up a variety of new win condition paths, it ultimately just fueled too many NPE (Negative Play Experience) decks. As such, pulling it from the environment is the best path forward in protecting the game’s health. Second, the card has been an incredible drag on design and playtest. When literally every skill check has to be measured against whether it fuels Showboating, that’s a severe indicator that the card has problems. By hitting the Fortress deck type (which these changes should do), we can hopefully open up the design of Spirits more in the future. This would be impossible with Showboating in the meta as any good card for Eagle Wardens was fundamentally a good card for Fortress. Hopefully this will make our job easier in providing fun and balanced cards to the players, and allow us to free up space to not need to measure every single card against it’s enabling of Showboating. First, Nico’s errata will help cut Fortress off from its incredible CP (Control Point) ‘bomb power’ (and the Landslide deck type ability to do the same in some circumstances). CP bombs are not necessarily bad for the game, but an uncapped CP bomb makes the game swingy to the point that we always have to worry about it beyond what is normal. This will hopefully keep Nico useful without making him overbearing. Second, this errata brings Nico in line with our current design philosophy. Uncapped cards did not cause much of a problem in the early game due to few available options. As the game has grown, however, the lack of future proofing has started to cause problems. This will hopefully cap the problems that Nico can cause for us and we won’t have to worry about him as much. Showboating breaks what I always felt was a cardinal unwritten rule. Control Points may be challenged and fought for. Allie is booted in the town square so can be called out. Deeds can be taken control of. Establish who’s in Charge – Meet the New Boss- Technological Exhibition are all jobs that can be opposed. Showboating can only be stopped if you use targeted removal. It allows for decks to have a win condition solely built around non-player interaction. Showboating has become a burden on design space as well as making decks non-viable if they did not run large amounts of targeted removal. Nicodemus Whateley has always been a strong way to push for victory, but action needed to be taken after ‘Spirit Fortress’ decks began using Beyond The Veil which created a tremendous number of nearly uncounterable control points. If Nicodemus and his ‘voters’ occupied Maza Gangs Hideout or Whateley Family Estate, the opponent could only stop the massive influx of control points if they either had a movement ability, removal job, or booting resistance (against the Estate). Nicodemus holding his Family Estate can still create a strong number of Control Points, but it will no longer be available as the sole win condition for Spirit Fortress decks.